FlashP AP is a free program that makes it easy to wirelessly copy sleep data from a compatible CPAP machine onto your computer where you can then view the results in your favorite sleep data software. It requires a compatible CPAP machine and a Toshiba FlashAir II (or newer) Wireless SD card. SD card capacity does not matter much since they are all much more than the CPAP machine needs anyway. Official documentation on how to configure the FlashAir II cards for your network can be found here. Also see the great resources at the TNET Sleep Apnea Information site. This app is written in Java so it will run on Windows, Mac and Linux! It requires Java 7 (1.7.0_6) or newer which is already installed on most computers. Don’t have Java installed? You can get it for free here. Since all this program does is copies the data from the WiFi SD card to your computer, adding support for different CPAP machines should be pretty easy to do. Support will be added for more machines once I’ve learned how the data is structured on the SD card (i.e. how the data files and folders are organized on the SD card). With that in mind, many older CPAP machines may have SD card slots but will not work with SDHC SD cards and for that reason alone, many older machines will not work with the FlashAir SD cards because they are based on the SDHC standard. Consult your manual to be sure. While initially written for the FlashAir II, several users have reported success with the original FlashAir (8 GB model), and in at least one case with a PRS1, only the original 8 GB model worked with the machine. There is an email link in the ‘about’ window inside the program where you can send me an email. You may also use the Contact link found on this website. I will try to help you get it working if you are having problems. You can also send me an email if you’d like me to look into adding support for your CPAP machine. 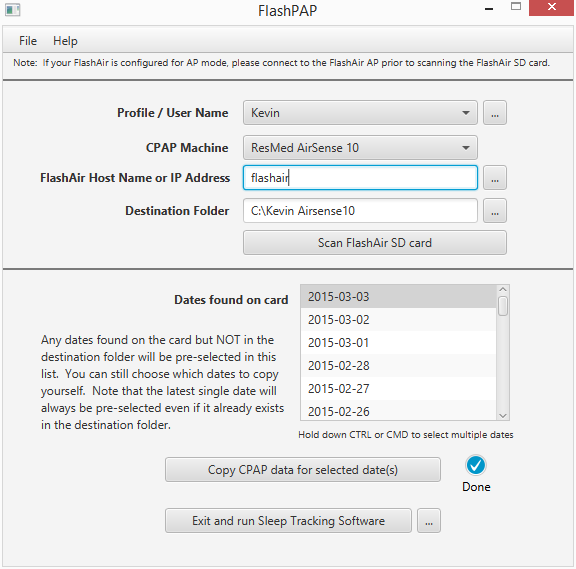 There is also an excellent write-up on FlashPAP as well as configuring your FlashAir card available at the TNET Sleep Apnea Info site. After downloading it is recommended to create a folder on your desktop and unzip to that folder.